Q61 - How far should you turn your head towards the target? I can turn my head quite far without any discomfort but sometimes noticed that the ledge on my tab was sitting nicely under my jaw whereas at other times I couldn't even locate the ledge because it was outside of my jaw or just connecting with the outside of the jawbone. I was wondering why I was getting these inconsistent anchor points until it dawned on me that it was all due to how far I turned my head. If I turn my head so it is virtually over my bow arm, I can clearly see the target with both eyes open but the muscle down my neck sticks out and I cannot anchor my tab correctly - it either floats outside of my jaw or just on the edge of the drawbone and the connection is not solid. However, if I turn my head slightly, so that it faces 1 O'clock, both my eyes have to be turned left (I am right-handed) towards the target and my neck muscle remains relaxed such that my tab shelf fits nicely under my jaw. Therefore, I was wondering if I should be turning my head 12 O'clock to directly face the target or 1 O'clock so that my eyes have to look to the left. I'm sure there is a simple answer but my dilemma is the compromise between a nice tab position under my jaw and the target picture. Obviously, if I turn my head 12 O'clock I get a nice complete target picture but a poor tab position. If I turn my head to 1 O'clock I get a nice tab position but a more strained target picture due to moving my eyes to the left. Which one (if any) is correct? I can turn my head quite far without any discomfort but sometimes noticed that the ledge on my tab was sitting nicely under my jaw whereas at other times I couldn't even locate the ledge because it was outside of my jaw or just connecting with the outside of the jawbone. I was wondering why I was getting these inconsistent anchor points until it dawned on me that it was all due to how far I turned my head. 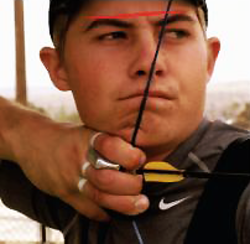 If I turn my head so it is virtually over my bow arm, I can clearly see the target with both eyes open but the muscle down my neck sticks out and I cannot anchor my tab correctly - it either floats outside of my jaw or just on the edge of the drawbone and the connection is not solid. However, if I turn my head slightly, so that it faces 1 O'clock, both my eyes have to be turned left (I am right-handed) towards the target and my neck muscle remains relaxed such that my tab shelf fits nicely under my jaw. Therefore, I was wondering if I should be turning my head 12 O'clock to directly face the target or 1 O'clock so that my eyes have to look to the left. I'm sure there is a simple answer but my dilemma is the compromise between a nice tab position under my jaw and the target picture. Obviously, if I turn my head 12 O'clock I get a nice complete target picture but a poor tab position. If I turn my head to 1 O'clock I get a nice tab position but a more strained target picture due to moving my eyes to the left. Which one (if any) is correct?" The eyes square to the target provides for a stronger neurological position. Obviously, if you try to do something new it doesn’t feel comfortable. However, if you can get your head to the 1 o’clock position I wouldn’t worry too much. One of the main things is not to change head position by even one mm from the Set position. Attached a photo of prefered head position.